It’s funny how you often don’t notice how broken something is until you see it repaired, like your beloved old house that has lots of charm and character but has seen better days. Then, with a little bit of fresh paint and new furniture, it’s suddenly like a new place. With the Muny, it wasn’t exactly “broken” but it was starting to show its age. I enjoyed most of the past Muny productions I saw and the performers were often top-level, but I did always keep in mind that this was the Muny and not Broadway or the West End, especially in the technical aspects like costumes and sets. This production, the first of their 2012 season under new Executive Director Mike Isaacson, didn’t need that qualification. Thoroughly Modern Millie is a top-quality production in every way, and it seems to signify a new era of quality, innovation and energy for this 93-year-old venue. Millie Dillmount’s (Tari Kelly) journey from small-town Kansas to New York City is almost Oz-like in its setup, except that Millie isn’t trying to go back home. She wants to make it big in the city, with the aim of finding a job as a stenographer with a rich boss to marry. Her journey takes her to the Priscilla Hotel, a boarding house for aspiring actresses, jealously watched over by the villainous Mrs. Meers (Beth Leavel), a washed-up former actress and criminal who puts on an obviously fake Chinese disguise in an attempt to hide from authorities. From there, she encounters many unusual characters and exciting places as she discovers more about the Big Apple and about herself. The plot is somewhat contrived but the way the show is written, as a playful homage to the 1920’s, makes that not matter as much. It’s a thoroughly entertaining show from start to finish, and the wonderful cast makes it even more so. I was happy when I found out that the role of Millie would be played by Tari Kelly in this production. I had previously seen Kelly as Reno Sweeney in Anything Goes on Broadway, as Sutton Foster was out that day and Kelly was her understudy. Kelly was sensational in that show and gave a true star performance, and she does the same here in Millie. She sings, dances and acts with total proficiency, giving a funny, warm and convincing performance as the Kansas girl trying to make it in the big city. It’s another Sutton Foster role (Foster originated the role on Broadway), and I hope that Kelly doesn’t spend much more of her career replacing Foster because she certainly deserves to be recognized as an outstanding performer in her own right. She starts out the show alone on that enormous Muny stage, and holds the audience riveted from her first note. The rest of the performers are excellent as well. Andrew Samonsky has an easy charm and a strong, smooth voice as Jimmy, the man Millie meets and reluctantly falls for, and he and Kelly have great chemistry in their scenes together. Megan McGinniss makes an appropriately naïve and spoiled Miss Dorothy Brown, Millie’s new-found best friend who is eagerly looking to discover “How The Other Half Lives”. Leslie Uggams oozes sophistication, class and wit as wealthy singer and socialite Muzzy Van Hossmere (the role she played on Broadway), and Beth Leavel is an excellent comic villain as Mrs. Meers. She has previously played Miss Hannigan in Annie at the Muny, and this is a similar role in many ways. Leavel makes the most of her time on stage, hamming it up and putting on a ridiculously overdone caricature of a Chinese accent. Also putting in fine performances are Francis Jue and Darren Lee as Mrs. Meers’ increasingly fed up henchmen Ching Ho and Bun Foo, who speak mostly in Chinese that is cleverly subtitled in a little box on the backdrop of the hotel corridor. Jue in particular as the lovesick (for Miss Dorothy) Ching Ho is a delight. Stephen R. Buntrock as Millie’s droll boss Trevor Graydon and Tory Rose as his head secretary Miss Flannery are also standouts in an all around superb cast. The show is full of great, well-executed musical moments, from the charming (Jimmy’s “What Do I Need With Love”), to the hilarious (“The Speed Test” with Millie and Mr. Graydon), to the sophisticated (Muzzy’s “Only In New York”) to the cute and cleverly chorographed (“I Turned the Corner”, which is sung and danced on a skyscraper window ledge by Millie and Jimmy). There are also stage-filling production numbers like the opening combo of “Not For the Life of Me” and the title song. Mrs. Meers’s ode to jealousy and revenge “They Don’t Know” is a comic highlight as well. 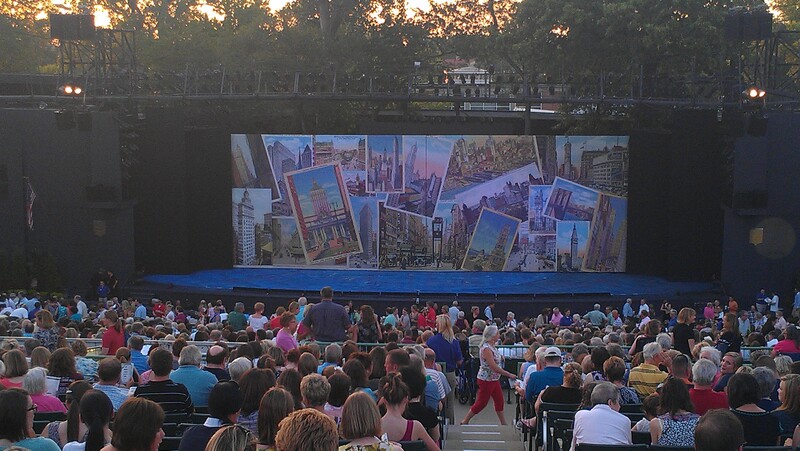 As for the technical aspects of the show, the Muny has really pulled out all the stops this year, adding an impressive LED “scenery wall” that serves as a backdrop in the city scenes and is used to fun comic effect as Millie and Miss Dorothy are tap dancing in the elevator early in the first act. The costumes aren’t rented this year, and they are meticulously designed, along with the fun set pieces of movable skyscrapers, jail cells that look like birdcages, and the elaborate balcony set of Muzzy’s swanky apartment. The choreography is sharp, fun and appropriate to the time period, and the large dance ensemble does a great job. All of these aspects work together to create a suitably authentic 1920’s atmosphere, and a slick (but not too slick), glossy world-class production. With the possible exception of the stunning production of Les Miserables in 2007, Thoroughly Modern Millie is the best production I have ever seen at the Muny. It represents more than a fresh coat of paint. It’s a complete revitalization of this age-old St. Louis institution that I hope continues throughout the season and for many seasons to come.